It’s that time of year again! Parties, presents, family, friends and of course, food. 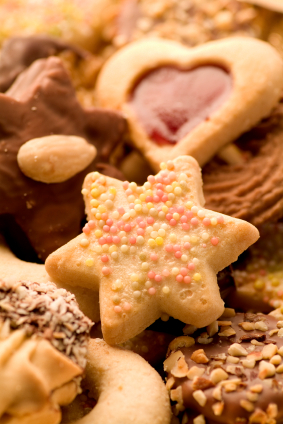 Whether you have children in your family or not, Christmas cookies are a fun, time-honored tradition that so many of us big kids crave. But how do you tackle the cookies without ruining your diet? And how do you manage to squeeze in time for baking — in between all of your shopping and wrapping? 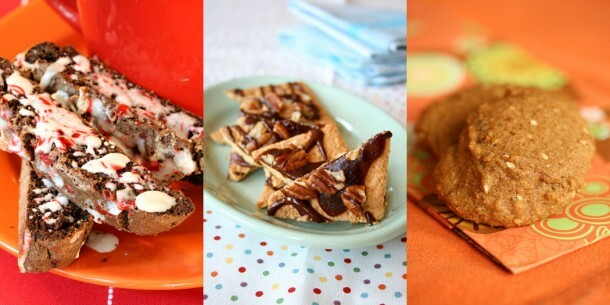 Peppermint biscotti and chocolate toffee grahams are both festive choices that will delight Santa and anyone else who happens to stop by this holiday season! If you want something of a more traditional flavor, then try my gingerbread cookies — they will satisfy that festive food craving without sabotaging your good will! Have the trips to the mall, the endless hours wrapping and the extra hours at the office left you with no time to bake? Even with the lagging economy, you can have your cookies and eat them too this season. By picking one dough recipe and using it in multiple ways, you can still manage to make an array of Christmas cookies in a cinch and on a dime. I like my chocolate cookie dough for this purpose… it’s multi-functional! I use it year-round and just switch up my cookie cutters and decorations depending on the season. So, let your imagination take over, and bake up some holiday cheer. In the holiday spirit, check out my granny talking about her traditional holiday cookies. Would you not even think about straying from your chocolate chip cookies? Even during the holidays? Then check out my cherry chocolate chip cookies. Not a fan of cherries? Then try dried cranberries instead!